What do you get when two beading superstars team up to explore the limits of colorful flexible beading wire? Non-stop fun, that's what! Jewelry artists will all know the work of Jamie Hogsett and Sara Hardin Oehler. 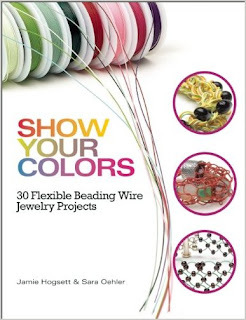 Show Your Colors is the result of their collaboration: 30 fun and fabulous jewelry projects that keep the colorful wire front and center! The new colored flexible beading wire is used as a key design element instead of hidden away. This unusual treatment adds a fun and very colorful flair to the contemporary designs that the authors share. This book is especially excellent for beginners, since Jamie and Sara decided to make their projects accessible for all ability levels. They've included all the basic techniques you'll need, plus...you're really gonna like this!...sources for all the beads and components. Yay! Although the ladies want to encourage us to explore color and pattern for ourselves, they also recognize that many beginners really want to reproduce a few projects exactly before venturing off on their own. Well, be happy...they've made this possible! There is a whole section of projects that use a knitting spool, and one of my favorite designs can be found there. The Long & Winding Road bracelet uses three lengths of knitted wire in three colors, with seed beads randomly placed throughout. The knitted pieces are braided together and wrapped twice around your wrist...very cool! Just leave me a comment below and you'll automatically be entered to win. If you tweet or post on Facebook or other social spots about the contest, you can leave a second comment and be entered twice! Looks like a great book. Would love to win it. Wow! Looks like a great book! I hope I can win because I would have fun making jewelry with my granddaughter this summer. I've been drooling over this book for a while, I'd love to win it! I have been wanting this book! I would love to win it! Thanks for the giveaway! This looks really interesting. Would love to have the book and give it a try. Who doesn't need help when it comes to colors? It also depends greatly on what colors you have on hand! I love to work with wire and I string too so I was intrigued when the colored wire came out. This would be a great book to help me get started using them in different ways. Thanks for this and your other giveaways. I look forward to your posts and the myriad info you share with us. Color makes a difference between a good piece and a great piece. This book will help me gain greatness...if I win ;)!!! I just posted this giveaway link to my FB under my real name, which I will reveal to you if this comment is picked. Thanks for the chance to win! I have heard good things about this book and I would love to win a copy. Thanks for the give away. This would be a great addition to my library. Would love to win this book, and May 23 is my birthday! Yea! Just ordered several spools and am ready to go...just need the book!